Here is a new piece I donated to the Emergency Artists' Support League. Loads of great artists, great cause. The auction is 6-10 pm Saturday, September 30 at South Side, 1409 South Lamar Street. More information can be found here. 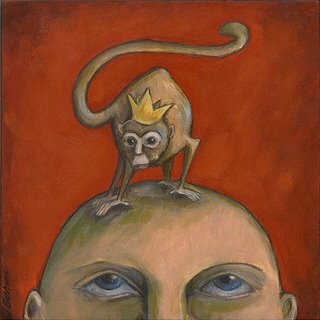 I'm fascinated by the whimsical iconography in your work .. and the monkeys.